Today, there are a whole slew of exotic performance cars that make well over 500 horsepower and can either come close to or even surpass 200 mph. This wasn’t always the case with exotic performance cars. In the last decade there’s been a massive horsepower war which has given customers with a large amount of disposable income, the opportunity to buy some incredibly fast cars. Let’s rewind back to the mid-1980s when the litmus test of a fast performance car was something with at least 200 horsepower and a top speed of around 130 to 140 mph. The hottest American performance cars at this time were just barely meeting this benchmark. So you can imagine the fanfare that was caused when Ferrari at this time released the all-new 1985 Testarossa and surpassed these numbers by a large margin. The Testarossa was the replacement of the Ferrari’s Berlinetta Boxer which became an exotic car icon during the 1970s and early-1980s. However there was one very big problem with the Berlinetta Boxer, it was not available in the United States. Ferrari felt the high costs of emissions and other U.S. government regulations compliance for the Berlinetta Boxer was not worth the very limited sales it would yield. Ferrari eventually changed its mind and decided by the 1980s, it was time to offer a super performance car in the U.S. market. So when the Berlinetta Boxer was laid to rest, the all-new 1985 Testarossa was available for sale in the U.S. market. Ferrari had made sure the Testarossa met all U.S. emissions and safety regulations as it prepped for production. It was a wise move, for the Testarossa was one of the most successful new car launches that Ferrari had ever encountered. The American automotive press was nothing short of mesmerized with this new exotic from Italy. Overnight it was the new "it" car, no matter whether you were rich or poor, young or old you wanted to own this car. It was just as wild in terms of its overall design as the other revered Italian exotic available in America at the time, the Lamborghini Countach. However when the Testarossa was released the Countach overnight turned into stale bread. The Testarossa was the future of exotic cars, it had a very aerodynamic shape of the slipperiest of race cars. The Testarossa would introduce the world a new super car exterior design which was a silhouette of a lean wedge type front-end and an extremely wide and bulky rear design. This exterior gave the Testarossa a very tough and muscular look. But the most radical part of the styling were the massive cooling vents that were so big they encompassed the side doors and both rear quarter panels. These cooling vents provided cool air into the two radiators – one located on each side of the rear of car which was the reason the rear was so wide. Functionally it was a stroke of genius since problems with engine overheating was a typical trait of most exotic rear engine sports cars at the time, but with this innovative design the Testarossa didn’t succumb to these problems even on hot days during stop and go city driving. The Testarossa was Ferrari’s first high dollar exotic that was civilized. Ferrari saw great success by offering the civilized entry-level mid-engine 2-seater sports car – the 308 in the mid-1970s. By the early 1980s the Ferrari 308 was very popular since it was seen weekly on the popular TV show Magnum P.I. The 308’s beautifully sculpted lines were designed by famed Italian designer Pininfarina. With the wild success of the 308 in the American market, it was only natural that Ferrari would take the gamble and offer its new Testarossa in the US. The Testarossa was also designed by Pininfarina. Not only was it the arguably Pinifarina’s most beautiful designs, It was one of the best looking sports cars to come out of the 1980s decade. 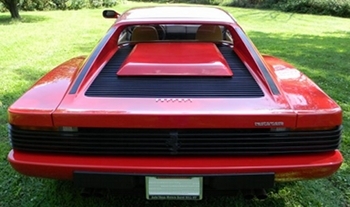 The Testarossa would also get its share of small screen time with a regular appearance on the hit TV show Miami Vice. As exciting as the exterior was, Ferrari made sure the emphasis was placed with the racing derived engine just like many Ferrari models before it. In comparison to the Testarossa, the Ferrari 308 was a toy, its V8 may have been a dual overhead cam (DOHC) design with four valves per cylinder but it had a paltry 2.9 liters of displacement. And a sophisticated Bosch port injection was the 2.9 liter’s induction system. The net result was the 1984 308 GTBi/GTSi available in the US market produced 230 horsepower and 188 lb-ft of torque. This power output was good for a flat-15 second quarter-mile time, which helped it to compete well with such cars as Porsche 911, Porsche 928, and Lotus Esprit Turbo . However the 308 was mince meat against the typical European exotic sports car. That’s were the Testarossa came into the picture, it provided not only a 12-cylinder engine but had just over 2.0 liters more in engine displacement than the 308. The Testarossa’s 12-cylinder was 302 CID or 5.0 liters of displacement. By European standards this was considered a very large displacement motor. Unlike many European sports cars back in the day, including the 308 that had a hopped up run-of-the-mill production type engine, the Testarossa had a genuine race bred motor that was dropped into a production passenger car. The 12-cylinder was not a V12 configuration like its main competition the Lamborghini Countach had, it was a flat-12 – 180 degree piston configuration. The Ferrari flat-12 was designed to give Ferrari an engine that would provide its race cars with the lowest possible center of gravity. And for the Testarossa’s flat-12, Ferrari used a race derived dry sump lubrication system which allowed the engine an even lower profile than a standard flat engine configuration since there was no oil pan below the engine – instead oil was pumped from an oil tank. This also had the added benefit of lowering the engine so close to the ground that the Testarossa unlike most mid-engine sports cars, provided the driver with a decent sized rear window with excellent visibility. The Countach as a comparison, with its very tall V12 gave the driver almost no rear visibility since it was forced to use such a small window. The downside to using a dry sump system was that it required a longer warm up period before driving the Testarossa on the road. And for those that were impatient and didn’t allow the engine to reach full operating temperature before driving the Testarossa, they risked damaging the engine. Ferrari along with managing to make the flat-12 produce more horsepower than the older version of this engine found in the Ferrari Berlinetta Boxer, it also was able to drop significantly the compression ratio from the Berlinetta Boxer’s 9.2:1 to 8.7:1 for the Testarossa. The Testarossa’s flat-12 used just about every innovation that was available back in 1985 such as dual cams, 4-valves per cylinder, dual distributors (one for each cylinder bank), and a sophisticated computer controlled twin Bosch port fuel injection systems (one for each cylinder bank). Horsepower was an amazing 380 ponies which by todays standards of 500-plus horsepower exotic sports cars may not seem like a lot, but back in 1985 it was sky high. Torque was also impressive at 354 lb-ft. Back in 1985, the hottest American performance car was the Corvette which had a 5.7 liter Tuned Port Injection (TPI) V8 that produced 230 horsepower and 330 lb-ft of torque. 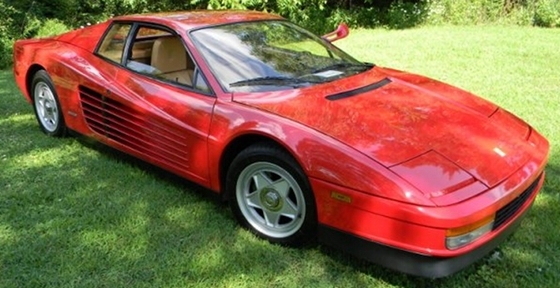 So you can see why many gearheads were obsessed with the 1985 Testarossa when it was released. Of course its 181 mph top speed which was faster than the Countach and made the Corvette’s 150 mph top speed look like a trip in the slow lane, helped to bring over many fans to the Ferrari camp. And if that didn’t do the trick, its Star Wars hyperdrive like acceleration certainly did. Motor Trend magazine (July 1985) obtained a 0-60 mph time of 5.29 seconds and a quarter mile time of 13.4 seconds at a trap speed of 110 mph. This was no easy feat considering the Testarossa by 1985 standards was a very heavy 2-seater, weighing in at a very hefty 3,700 lbs. Mind you, this was before air bags, anti-lock brakes, and other safety mandates that have added at least 500 lbs to most modern cars. A car like the Testarossa if it was to be produced today would probably weigh in at around 4,500 lbs. To its credit, Ferrari was trying to keep the Testarossa’s weight to a minimum by using aluminum body panels to augment the steel roof and doors. And it should be noted that helping this heavy car accelerate as fast as it could was superior aerodynamics. The Testarossa was the first Ferrari to spend a lot of its development time in the wind tunnel, and the impressive .36 drag coefficient speaks for itself. The Countach had a drag coefficient of .42, which doesn’t seem that much higher, but during high speeds where even a little aerodynamic advantage can yield so much better returns, the Testarossa had massive aerodynamic advanatage. For instance the Countach produced 414 horsepower (34 horsepower more than the Testarossa), its lower top speed was due to the fact it didn’t cheat the air as good as the Testarossa at high speeds. Being that Ferraris were well known as art forms, it came as no surprise that the engine was setup in the same manner. Opening up the rear hatch even today still has many in awe – the beautiful dual plenum intakes, aluminum engine, and bright red heads to automobile fans were better than any museum painting. Ironically the Testarossa just like the original Testarossa race car that was built from 1956 to 1961 had red heads which was how they both got their names – Testarossa in Italian means "red head". The 1985 Testarossa was the complete polar opposite of most mid-engine exotic sports cars at the time, most of the engine and its accessories were very accessible allowing most parts repair or replacement to be an uncomplicated task. Most young people today have become accustomed to the modern Ferraris which are all automatic transmission equipped cars with paddle shifters – just like a modern Formula One race car. 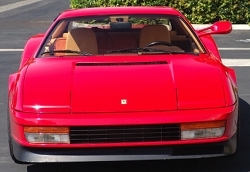 Back in 1985, Ferrari was well-known for its zero tolerance policy on automatic transmissions. The thought of a Ferrari with an automatic transmission was similar to building a hot fudge sundae by mixing a combination of hot dogs and ice cream together. The Testarossa was equipped with only a 5-speed manual transmission that transferred power to a rear limited slip differential. The Testarossa came equipped with Ferrari’s tried-and-true chrome shifter stick with a black round ball on top and the legendary Ferrari chrome shifter gate. The only downside for American drivers was the gear placement – the 5-speed’s shift pattern had reverse where 1st gear normally was, and 1st gear was were 2nd gear should be – it took some getting used to. 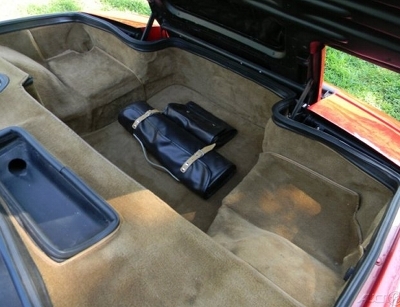 Back in 1985, the Testarossa had all the stuff, real drivers used. 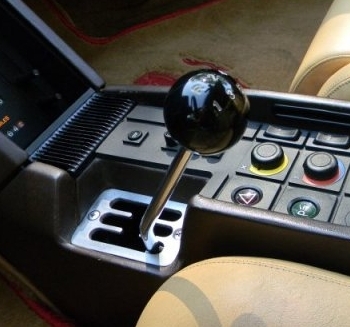 With a rock hard clutch that gave your left leg a heavy workout and some brut arm force needed to shift the short throw shifter – Testarossa drivers actually felt like they were driving – unlike today where driving a new Ferrari is like playing a video game. It required acquired skill to drive the Testarossa, it was a true driver’s car and not a rich man’s toy like most modern Ferraris have become which any poorly skilled 16-year old with a driver’s license can drive. The 1985 Testarossa may have had a steep base price of $87,000 (US dollars) which only the well-heeled could afford, but many of these rich clientele were skilled drivers who could operate with great precision a Testarossa. In other words if you were rich and wanted an easy sports car to drive, something along the lines of an automatic transmission equipped V12 powered Jaguar XJS was par for the course. Looking at the Testarossa, it appeared like it could handle the tightest hairpin turns with ease and stop on a dime. Unfortunately making the Ferrari handle and brake like a sports car when it weighed like a heavy American 4-door sedan was no easy task. What Ferrari did was tweak the 4-wheel independent suspension so it could handle high speed tight turns with ease and provide 4-wheel disc brakes that used very large racing type rotors. On the standard skidpad test the Testarossa was good for about .88 g which made it one of the best handling production cars in the world. Ferrari proved you didn’t have to have a light or small car to have fantastic and nimble handling. Today it’s commonplace for exotic sports cars pushing 4,000-lb mark, but back in 1985 this was the exception. The only downside was the lack of power steering and very wide front tires when mixed with parking lot driving speed, the Testarossa’s steering was obstinate and required a lot of upper arm muscle to turn the steering wheel. Over 10 miles an hour the steering was easier to maneuver and by higher speeds it was very easy and ultra responsive. Offset nature of the foot pedals was a feature that mid-engine sports car owners were accustomed to and was found on the Testarossa. Due to the passenger cabin pushed forward just like most mid-engined cars and the wide front wheel wells, the clutch, brake, and accelerator pedals were placed fairly far to the right when compared to most front engined cars. For those who when buying a Testarossa were purchasing their first mid-engined sports car, there was definitely a learning curve with these pedals. 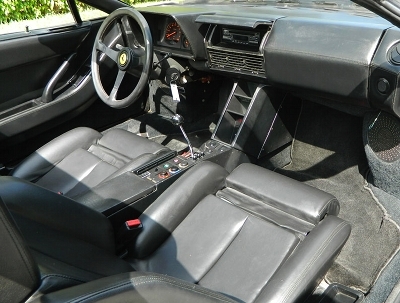 Even though most of the many kudos back in the day were given to the Testarossa’s exterior and performance, the biggest leap forward at that time when compared to previous Ferrari models and most exotics, was the luxurious interior. 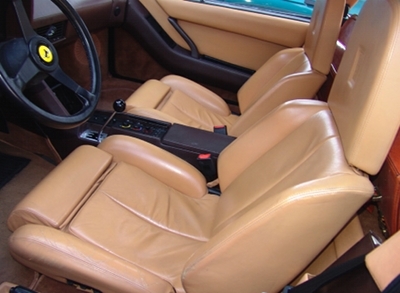 There was no denying that the interior had that modern Italian look. However there were standard Connolly leather bucket seats – which was the same fine leather found on the most of expensive of cars back in the day. These seats provided excellent lateral support, which was very important in the tight turns. The seats looked flat, but were extremely comfortable. For the driver the right elbow and arm were very comfortable, since the console was placed and shaped perfectly. Ferrari also did a fantastic job of including just about every luxury option the mid-1980s offered – all power options were standard which included such items as power windows and power seat controls (on both seats). However the most impressive power option was the power opening passenger side glove box door – the button to active it was in the center console. There was a world class audio system residing in the cabin, you weren’t going to find anything better back in 1985 from the factory. Ferrari placated traditional exotic sports car buyers who may have not wanted an audio system, it hid the stereo head unit behind a dash door in the upper-center part of the dash. When the door was closed no one is any wiser that there was a audio system in the car, and when the door was opened the stereo system was easily accessible. And believe it or not, there was ample cargo space under the front hood – enough to fit decent sized luggage. The dash pad and trim pieces were the best you were going to find in the 1980s, and they had the typical sporty squared look very popular at the time, with a splash of Italian stylish flair. All the gauges were well placed, the red on black was a great aesthetic touch. And who could forget the standard leather wrapped Momo steering wheel which was revered by Ferrari owners. The most surprising aspect of the Testarossa was that it was civilized. It was the first exotic sports car that you could comfortably use as a daily driver. Add to this, the bonus that driving around town didn’t require earplugs. The interior cabin was well insulated so the engine noise was just enough for the occupants to enjoy but not overbearing. The sound of the flat-12 was noting but pure joy, the quad tipped outlet exhaust had such a beautiful and harmonious sound. Many owners back in the day hardly ever used the built in audio receiver to listen to music – the sound of the engine won out most of the time as background music. Unfortunately, most of the accomplishments and great features of the Testarossa will be lost to history, since its looks were so much more beautiful when compared to everything else on the road at the time. It will probably be remembered for just its pretty face. However make no mistake about it, the Testarossa was a lot more than just a pretty redhead, it was a car that revolutionized exotic sports cars. Nothing was ever was the same in the automotive world after its release – the 1985 Testarossa was definitely a game changer.